Oh, and a bunch of stuff: dogtag thingies, stickers and temporary tattoos (WTF?) 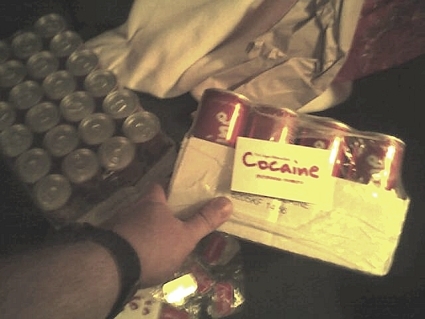 that all say Cocaine. People (including a couple of Redux authorized dealers) are getting almost $10 a can for it on eBay. Someone who bought a can in a store sold the receipt for $2. I am tempted to flip it for a quick $500 or so, but I think it'll be more fun to walk into a hipster bar and make them do tricks like trained monkeys. Do tricks or turn tricks? Depends on how much I like the monkey. Either way, there will be pictures. "I think it'll be more fun to walk into a hipster bar and make them do tricks like trained monkeys."